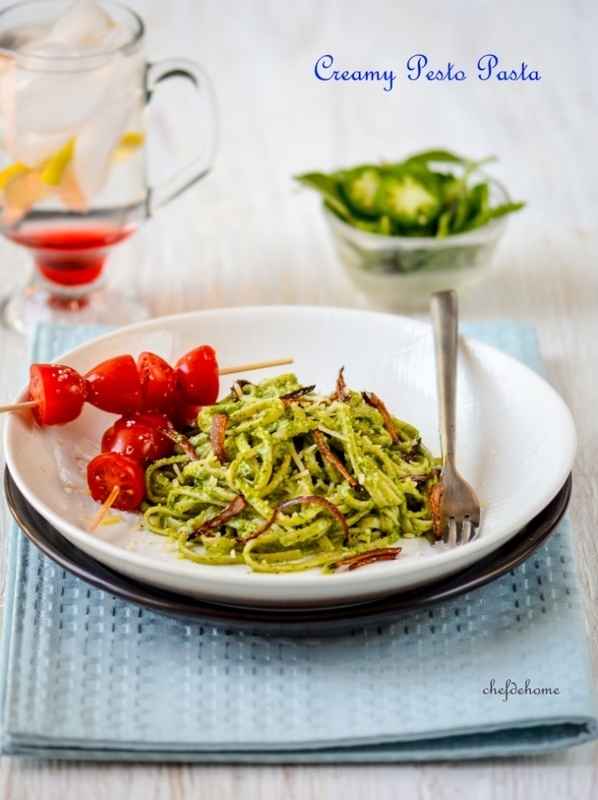 Linguine coated in creamy pesto sauce, served with caramelized onions and fresh cherry tomatoes. My family loves Pesto Pasta! 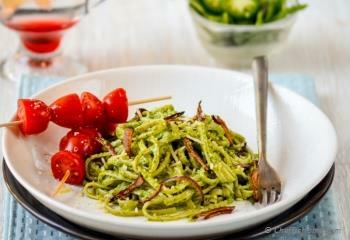 Other than taste, for me, Pesto Pasta means - worry-free-delicious-dinner! Really, pesto is a kind of sauce that can help you serve, a flavorful Italian dinner, using a few simple ingredients. 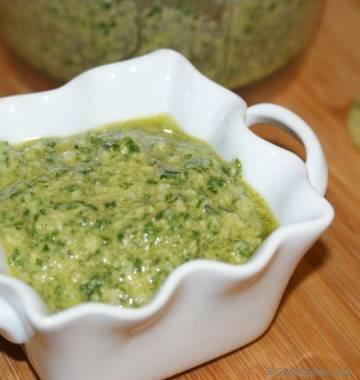 For these reasons, I LOVE to keep a batch of Homemade Pesto in my refrigerator. 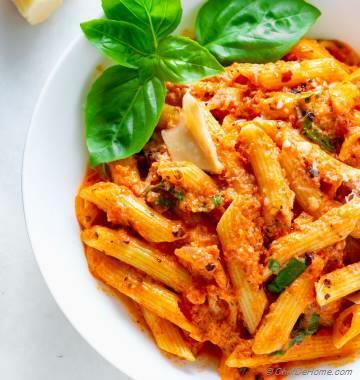 Then, whenever we crave for Italian Pasta dinner, this one pre-step helps me serve dinner in just 20-25 minutes! Even though I love Traditional Basil Pesto...... with time, my pesto recipes have evolved with my taste. I love going all-non-traditional and pretty much replace, all main ingredients of classic pesto, with whatever greens and nuts I have in-hand. This not just helps me utilize my fresh produce and keep it under-budget, but also helps avoid serving the SAME old monotonous Basil Pesto Pasta every-time. 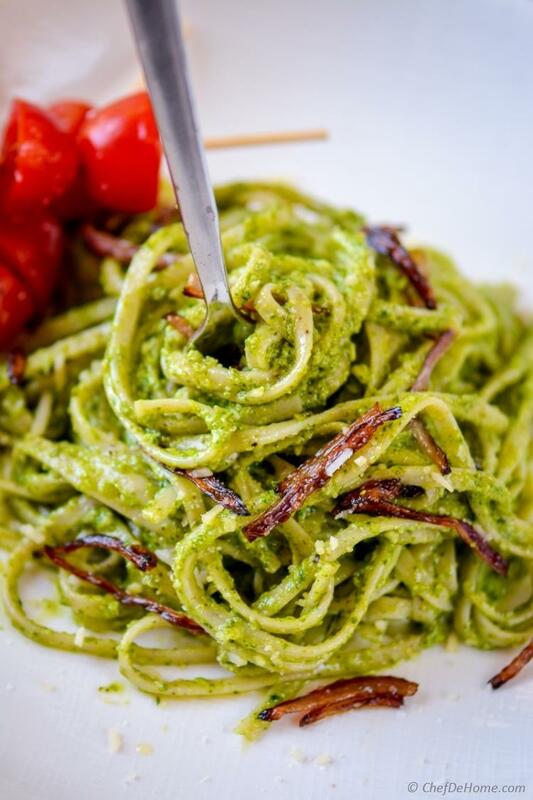 Today, I paired my fresh batch of Spicy Arugula Pesto (I shared this recipe a few weeks ago) with Linguine/Linguini pasta, caramelized onion, quintessential parmesan cheese, and some fresh sweet cherry tomatoes to cut-thru the richness! For your convenience, I have mentioned "Classic Basil Pesto" in recipe ingredients. However, you can really choose any pesto of your choice. I prefer homemade, but store-bought pesto sauce will also work fine. Please note, since pesto is the base for this creamy sauce, the flavor of pasta will change depending on kind of pesto used. 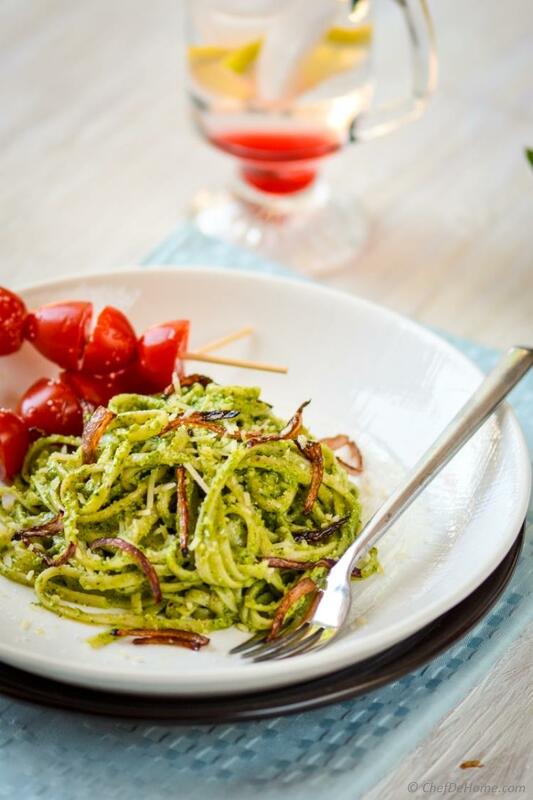 Like, if you looking for a pronounced basil taste, then go for classic basil pesto or if you want a spicy sharp taste, then opt for something like Spicy Arugula Pesto (listed below). I know!! I'm still counting this list! 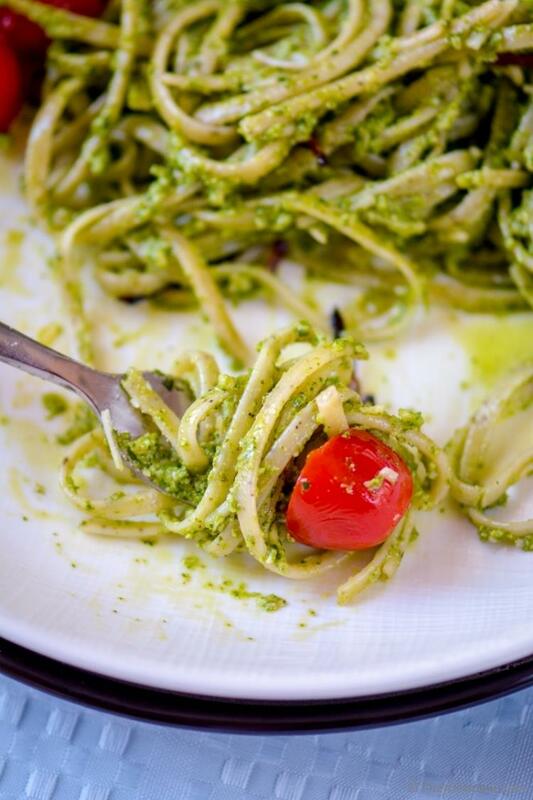 This Creamy Pesto Linguine pictures, I took while I shared Arugula Pesto, on blog. I decided to share these two recipes in separate posts since Arugula Pesto was vegan and this recipe does not like the "vegan" word :) I mean, heavy cream and nutty parmesan are two key components of any good creamy pesto sauce, almost irreplaceable for me. However, if you still insist, I can tell you, to make it vegan: replace cream with coconut milk and replace parmesan with nutritional yeast. 1. Bring a pot of water to rolling boil. Season with salt. Add pasta and cook as per package directions. While pasta is cooking, heat 1/2 tbsp oil in a saute pan. When oil is hot, add onion strings and cook until brown and caramelized (about 4-5 minutes). Drain on paper towel and set aside. 2. Wipe excess oil from the saute pan, and keep heat on. (Since pesto already has oil, I don't use additional oil to cook pesto.) Add pesto and heat until warm through (about 2-3 minutes). Don't cook for long or pesto turns very dark and does not taste fresh. 3. 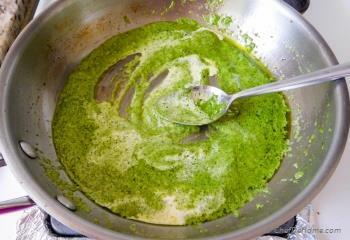 Add cream and mix in pesto. Let it heat for 1 minute, then switch-off the stove. 4. 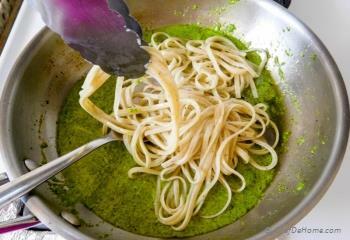 Add cooked pasta, half of the parmesan cheese, then coat pasta in the pesto-cream sauce gently. 5. 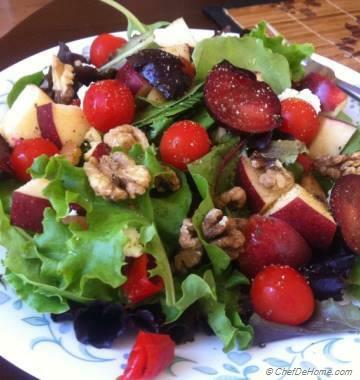 Transfer to serving plate and with cherry tomato and few caramelized onions. Sprinkle additional parmesan on top if needed. Serve and enjoy! This looks wonderful! 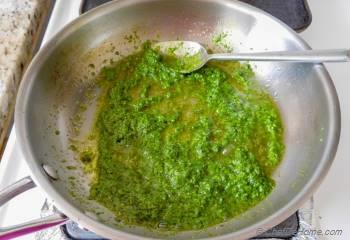 One trick I learned, when mixing the pasta with the Pesto, add a tablespoon or so of water that you boiled the pasta in. It makes the pesto coat the pasta perfectly, nice and silky smooth. Something to do with the starch in the water. Works great every time. Love your page! Oh yes, your should always reserve some pasta cooking water to freshen-up pasta. Jessy, not just pesto, any pasta+sauce combo will benefit from pasta water. Thanks for sharing this valuable tip here. :) Gauri our love for pesto is sure mutual. Thank you so much for kind words. I really appreciate it. I am all about pesto these days and this pasta looks so so good!! My mouth is literally watering hehe! Ami, thanks for kind words! These days, Pesto is making me crazy too. :) love it one everything! Thank you Shubha for your kind words! Yum! 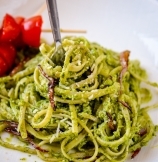 I can never have enough of pesto so keep the recipes coming Savita! love how creamy and comforting this pasta looks!